Wonderfully done! Love the twins on the front row. I really like her style of art--like Grandma Moses! Great shot and such a terrific looking painting. So much to look at. I like the couple kissing in the second row. Rosemary sure is a very talented lady. Love the variety of clothes, uniforms. And the twins on the front row. Wonderful artwork! I love the ladies' hats and dresses. Like it to. Nice painting and subject. Lovely piece of modern artwork. I like how the people in the front row have a different natural pose. So many wonderful details! She has captured this time period beautifully! So much detail! Love the red! What a sweet painting. Lovely imagination - so much going on there. 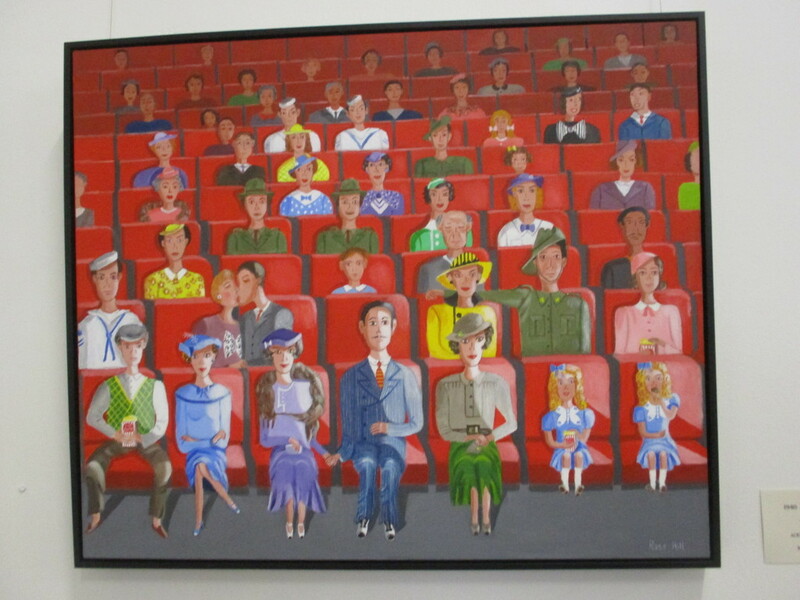 A wonderful piece... the twins in the front row are adorable. Delightful art. It looks like the artist has a great sense of humor as well as talent. Quite an interesting and colorful study! What an interesting painting, they all look very prim and proper. Quite a few military folks in the picture. Wonderful "people". Love it! Love it too !! Such a variety of characters ! This is compulsive viewing... and I don't even know what they're watching! Thanks for you continue support and nice comments. Your friend is very clever.